That is a good question. This page is not meant to be a complete rulebook for players who already practice this sport. It is more meant to be a guide where you can find the most important pieces in the great Broomball-puzzle. As with most sports there are several different ways of playingthis game. Mostly depending on where in the world you are. We will focus on the form that are played in Sweden and on international level. The rules and regulations on this level are set by the International Federation of Broomball Associations (IFBA). Sweden is one of the members and are represented by The Swedish Broomball Association (called SBF). If you are interested in more information about this administrative part, we do recommend you to take a look at What the hell is Broomball? Worth mentioning is that in Finland and Russia they play a kind of Broomball called "Short-stick Broomball". They use shorter Brooms and a smaller rink but similar rules. This type however, is not supported by the IFBA and will not be discussed more here. The first Broomball was played in Canada and in the northern parts of the USA sometime round the turn of the last century. One theory is that the people that cleaned the ice for curling and skating was the first to hit a ball with a broom. Maybe inspired from old Indian-games (like Lacrosse) did this evolved to what we now call Broomball. To make it possible to shoot harder and with more precision did they rebuild their brooms more and more. They cut the piassava shorter and winded it with rope. They even dipped it in water and let it froze to get a hard head for better passing- and shooting-qualities. Next step in the evolution was to dip the broom-head in floating rubber and now you have a shape reminding of the modern broom. As the competition for better equipment goes on are there now quite expensive brooms on the market. Material like Chrome-alloy, Carbonfiber and Titanium are used. The equipment used in Broomball have several simularities as well as differeces compared with Ice hockeyequipment. The most eye- catching differance is the use of shoes instead of skates. D� en av As one of the main thoughts with the game is that "ice is slippery", is all kinds of metalstuds or spikes forbidden. A modern Broomball-shoe has therefore a "sponge"-like rubbersole with hundreds of small rubber-studs (it is a simular construction as that one of a modern high-friction winter-tire for cars). This gives the player a surprisingly good grip on the ice without breaking the rules. The second big difference is the stick you are playing with. We use a stick that we call a Broom. The Brooms used today has only the name in common with the original ones used in the beginning of the 20th century. The origin was just an ordinary piassava-broom, winded with thin ropes to make it stiff enough to hit a ball with. Nowadays is this old construction replaced with more modern materials like aluminum, rubber and even carbonfiber. But just like on the hockeysticks is the woodenhandle still widely used by many players. Instead of a puck we hit on a 5'' ball with our brooms. They are made of a rubber shell and does not bounce at all. Depending on the temperature at the rink, do you use two different rubber-qualities. Blue balls for colder temperatures and orange or red balls for higher. Often referred as outdoor- and indoor-balls. A Broomball players personal body protection looks very much like hockey players (but is, except for the helmet, often lighter). Because the fact that you are running instead of gliding over the ice makes it necessary to move your arms and legs more than in icehockey. If you have shoulderpads do you have to have light-versions here to. No American football equipment is allowed. The goalkeeper looks much like the other players, except for his chest protection, stick-glove (the same type of glove used by icehockey-goalies) and stronger bars in the helmet protecting his face. of the goals which are bigger than a icehockey goal (ap. 60'' x 80''). The rulebook are much like the one used in Icehockey. To start with are there five players and a goalkeeper in each team. On international level is Broomball a fullcontact sport except when ladies (like Icehockey) and coed (mixed) team plays. Tripping, cross-checking, slashing and other violent behavior is punished by one of the two referees (often with two minutes in the penalty-box). Icing is also like icehockey. The biggest difference compared with icehockey, is the offside-rules. There is no blueline offside. 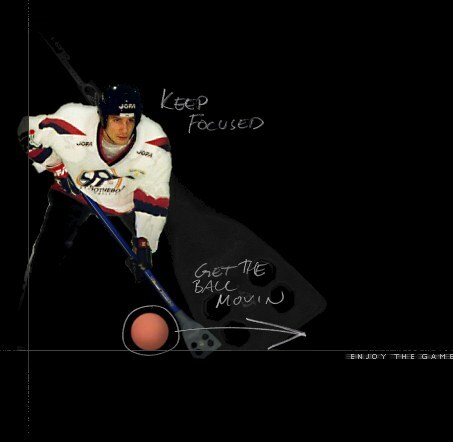 In Broomball it is the red line the ball have to cross before the player. Another difference is that you are allowed to swing your broom to the height of your shoulders (looks like baseball or golf). You are also allowed to footpass. Even handpass are allowed but only in your own defending zone.